Home » »Unlabelled » Everyone thought this man was obese. But when they operated on him, they found something shocking in his body — and it’d been growing there for over 10 years. Everyone thought this man was obese. But when they operated on him, they found something shocking in his body — and it’d been growing there for over 10 years. Roger Logan heard this sentence again and again, regardless of which doctor he went to. Because he didn't exercise enough, the large amount of fat on his abdomen had started to droop downwards and was now an enormous sack hanging between his legs, almost to the ground. Roger compared the feeling of having to carry around such a burden to constantly dragging around three sacks of cement. The 57-year-old spent the last four years almost entirely in an enormous armchair. His body size made it difficult for him to walk. He couldn't run his Gulfport, Mississippi, antique shop anymore and couldn't lead a normal life at all. Every doctor he consulted told him that obesity was the only problem he had. Roger had to be content with this diagnosis because his abdomen was too large for them to perform a CT scan or other conventional tests. In addition, no surgeon would take him on as a patient because the bulk was considered inoperable and the risk too high. Since no one could help him, Roger began to get depressed. He stopped eating and drinking, and ended up in the hospital severely dehydrated and with kidney failure. It was his wife Kitty who didn't give up hope and finally found a doctor in California who had already treated a similar case. He was prepared to operate on Roger. They drove out from Mississippi to California for the procedure, renting a small truck that Roger and his armchair could fit into. The trip took nearly 40 hours. And then at last, during the operation, Roger's real problem emerged. He wasn't just fat after all. 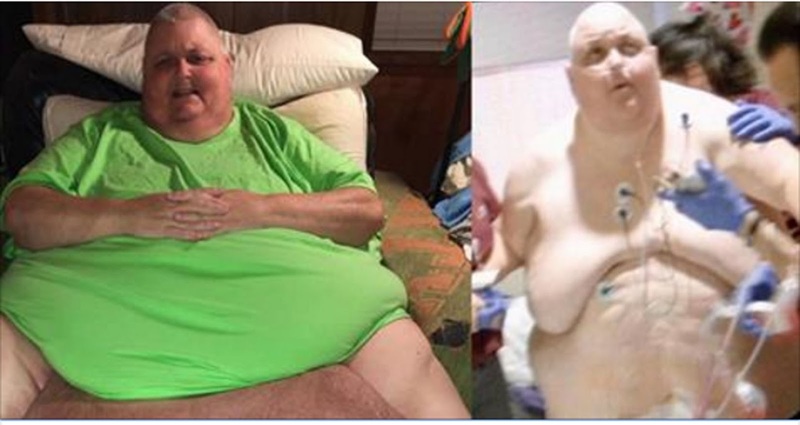 It turned out that he was carrying a 130-pound tumor in his belly! It had all started about 15 years previously with a single ingrown hair. The follicle got infected and grew into a tumor, which steadily expanded with access to its own blood supply. While his doctor announced that the surgery had been successfully performed without complications, Roger said it more succinctly on Facebook, with charming defiance and vitality: "Still here suckers!" After the operation, Roger needed to remain in California for two weeks of rehab. His recovery involves some serious physical therapy that has really put him to the test. Roger described the gruelling regimen in another Facebook post: the last time he "hurt this much and was this tired" was when he "got hit by a school bus." Good for Roger (and his wife Kitty) for persisting until they got the help he needed. This story is a perfect example of why, when it comes to medical advice, you should always get a second opinion!